Books ordered through Eastwind Books of Berkeley will be autographed by Patty Enrado! Request personalization via the “notes” field on the order form. Cover design by Melody Shah. Front cover photograph from the Lorraine Agtang Collection. Fausto Empleo is the last manong—one of the first wave of Filipinos immigrating to the United States in the 1920s and 1930s—at the home for retired farm workers in the agricultural town of Delano, California. Battling illness and feeling isolated in the retirement village built by the United Farm Workers Union, Fausto senses it’s time to die. But he cannot reconcile his boyhood dream of coming to the “land of opportunity” with the years of bigotry and backbreaking work in California’s fields. Then, his estranged cousin Benny comes with a peace offering and tells Fausto that Benny’s son will soon visit—with news that could change Fausto’s life. In preparation for the impending visit, Fausto forces himself to confront his past. Just as he was carving out a modest version of the American Dream, he walked out of the vineyards in 1965, in what became known as the Great Delano Grape Strikes. He threw himself headlong into the long, bitter, and violent fight for farm workers’ civil rights—but at the expense of his house and worldly possessions, his wife and child, and his tightknit Filipino community, including Benny. 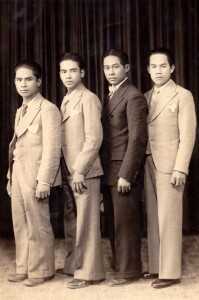 Filipino migrant workers at Fukui Photo Studio in Stockton, California, circa 1930s. The front and back cover photographs are reprinted courtesy of Welga! Filipino American Labor Archives, University of California Library, Davis. In 1994, I attended a local poetry reading by Filipino-American poets from the San Francisco Bay Area. One of the poets talked about a retirement village built in Delano in the early 1970s for retired Filipino farm workers who participated in the Great Delano Grape Strikes. My family moved to Terra Bella, California, in 1965, the year of the Great Delano Grape Strike. I had grown up not far from Delano and remembered the grape boycotts but not the strikes. My mother packed oranges in the winter and spring, and picked grapes in the summer and fall. My father, who immigrated to the U.S. in the late 1920s, spent most of his career as a cook, although he spent time farming when he arrived in California. Most of my father’s relatives who settled in Terra Bella also picked grapes and/or packed citrus fruit. That summer of 1994, while visiting my mother and father, I went in search of Agbayani Village. I interviewed an elderly resident, thinking that one day this information would become a story. At the time, I was looking to expand my MA thesis, a collection of stories about the Filipino community in Terra Bella that I had written while in the Creative Writing Program at Syracuse University. In the spring of 1997, I watched the PBS documentary on César Chávez—The Fight in the Fields—and read the companion book of the same name. After seeing the documentary, I wanted to know more about the Filipino involvement in the strike. The Filipino farm workers, led by labor leader Larry Itliong, initiated the strike; however, very little was said of their contribution. I learned from my relatives that I was related to Fred Abad, the last manong at Agbayani Village, who passed away in 1997 at the age of 87, a few months before I began my research. I interviewed another distant relative who was one of the original Filipino farm workers who struck with Itliong. I spent many a weekend at the Delano Record, searching for articles on the strikes and boycotts. In January 1998, I interviewed the late grower Jack Pandol at his farm. My mother accompanied me to the interview, and as we drove by Pandol’s camp, she casually remarked that my late father had once worked as a cook here, which was news to me. After stacks of research notes and books on the subject had been amassed, A Village in the Fields began to take shape and my protagonist Fausto Empleo emerged. My novel’s journey has taken 18 years and its release comes at a most fitting time—the 50th anniversary of when the Filipino farm workers walked out of the vineyards in Delano on that 8th morning of September. Carlos Bulosan’s iconic America Is In The Heart begins in the rural Philippines and ends in America with the start of World War II. Patty Enrado, with a clear and confident style, takes the powerful saga of those early Pinoys beyond the war years and to the end of the line. In A Village in the Fields, Enrado chooses an old Pinoy, Fausto Empleo, and examines his life and the lives of other manongs through the prism of Fausto’s struggles and challenges. His story is credible; it is also familiar—at least to those readers who knew the men of that fabled generation. In telling this foundational story of Filipino America, Village lacks only the passage of time. In contrast, America has found a literary/historical niche over the decades, and is required reading in many ethnic studies programs. In America, Bulosan is the book’s protagonist and narrator, who as a young boy in the then-American Philippines, dreams of an idealized America as described by a Thomasite teacher, Mary Strandon. It is a land where Abraham Lincoln died because he freed the slaves. The amazement of the young Bulosan points to the grinding poverty of the Philippine countryside. It also points to the reality of Filipino culture. In the rural and medieval Philippines of the early 20th Century, peasants were staggered by significant changes to the landlord-tenant relationship, where many landlords, obsessed by tariff-free access to America’s vast market, focused more and more on reducing costs and maximizing profits. The economic burden of these changes was born by each hacienda’s peasants, but their welfare inevitably became an afterthought to many landlords. Within this setting, it was also impossible for young (and dark) people like Carlos to imagine the owners of these great and increasingly profitable estates (often mestizos) to die for their darker-skinned peasants. And so it is no surprise that the young Carlos figured that America must be a significant improvement, this great, meritocratic place, where Lincoln died for a black person. Apparently and unlike in the Philippines, skin color didn’t matter there, but intelligence, discipline, and hard work did. Carlos, of course, was wrong, as was Fausto Empleo. And just as Bulosan, the young Fausto and his family were mired in poverty, scratching out a living by planting and harvesting rice. Early on, he decided there had to be a good life beyond the barrio, beyond the rice fields. And his ticket out, he concluded, was education, American style. Despite his father’s objection, Fausto and Benny, his cousin, decide to leave for America. There, the wide-eyed youngsters plan to join four older male cousins already in the promised land. Like Bulosan, Fausto’s idyllic dreams crumble quickly once he is on American soil. Starting with pervasive anti-Filipino hatred, especially virulent among whites on the West Coast, and the grim setting of Depression-Era America, the choices facing the Manong Generation were few indeed. For the Pinoys of that era, they were forced to live their lives in America’s underbelly—whether it was a flophouse hotel room in Seattle or Los Angeles, or the migratory road leading from backbreaking seasonal work on West Coast farms to the Alaskan canneries—and back again. Then repeat again the next year. And for years to come. The one interruption was World War II, when Fausto and many of his peers joined the U.S. Army, serving in the First Filipino Regiment in the Pacific. In the war against Japan, the loyalty of Filipinos—both in the Philippines and in America—served to reduce white American hostility toward them. But the uptick in race relations would more fully benefit the manongs’ American-born children, not the old-timers themselves. For Fausto, an Army veteran, that meant a return to the farms and the hard life he had lived before the war. The decades of low pay, backbreaking work, sacrifice, and shrunken dreams made what happened inevitable. The movement to organize farmworkers took hold in Delano, California in 1965, and Fausto joined the ranks of those Pinoys who walked away from the fields. In the minds of too many Americans, that single event in U.S. labor history is linked to César Chavez, the Chicano labor leader. But it was a Pinoy, Larry Itliong—the tough-talking, cigar-chomping organizer—who persuaded Filipinos to go on strike. Mexican workers followed the Filipino lead—not the other way around. Fausto’s loyalty to the union cost him dearly. He loses his house; his wife leaves him. But his loyalty to the union doesn’t waver. Standing up for something important is never for the weak. The story of Fausto Empleo is also the story of the Manong Generation. Patty Enrado tells it well. “Half a century after Filipino farm workers walked out of the Delano vineyards, they are finally getting the recognition they deserve for launching the California grape strike. This is due to the work of many who insisted their courageous story be told, including historian Dawn Bohulano Mabalon, filmmaker Marissa Aroy, and Assembly member Rob Bonta, as well as the Delano chapter of FAHNS that organized a 50th anniversary celebration of that pivotal event in September. Patty Enrado’s debut novel, A Village in the Fields, adds a new dimension to this important history. Enrado traces the life of the fictional Fausto Empleo, migrant farm worker, proud union member and striker, from his childhood in the barrio of San Esteban in Ilocos Sur to his final days at Agbayani Village, the United Farm Workers retirement home in Delano. By imagining the life and thoughts of one man, Enrado deepens the story of the Filipino grape strikers with an emotional texture that even the best nonfiction works cannot provide. With its vivid descriptions of the gritty, hard-scrabble migrant life, family loyalties and betrayals, and a tenacious hope for a better future despite racism, poverty, and vigilante violence, Enrado’s novel is a fitting sequel to Carlos Bulosan’s groundbreaking America Is in the Heart. By focusing on the UFW strike in the 1960s and 70s, Enrado’s story picks up where Bulosan’s 1946 novel leaves off, filling in a much needed, long marginalized history. Enrado begins Fausto’s story at the end of his life, when he is frail, lonely, and losing his grip on reality. Two young men, a nurse and the son of his estranged cousin, quiz him about his past. As a child, Fausto lives in a remote village, the son of an impoverished rice farmer. Thirsty for an education, he longs to attend the American teacher’s classes. His father won’t allow it. Fausto assumes it’s because he needs him to join him in the fields. But his grandmother reveals the real reason: ‘There was another war after the Spaniards were removed, but you won’t find it in American history books.’ During the Philippine- American War, she tells her grandson, U.S. soldiers torched houses and rice granaries, imprisoned her family, and subjected those accused of being ‘insurrectos’ to water torture. The American general’s order was that ‘Everything over ten’ would not be spared. ‘They were things, not people, to the Americans,’ his Lelang explains. Despite her warning and his father’s disapproval, Fausto and his cousin Benny decide to join their four older cousins in America. Their photos in snazzy suits with a shiny Dodge convince Fausto that he could make his fortune there. The cousins are reunited in a grimy room in Los Angeles—no shiny Dodge in sight. They join the stream of single Filipino men, traveling up and down the Valley, cutting asparagus and pruning grapes. Together they face poverty, backbreaking work, derelict labor camps, debt, hunger and race prejudice. Some, including Fausto, find romantic love and settle down in Terra Bella (a tiny San Joaquin Valley town, where author Enrado was raised), creating a San Esteban Circle there for mutual support. But with no labor laws to protect them, the cycle of exploitation by the growers seems unbreakable. Hope arrives with the Agricultural Workers Organizing Committee, led by the hard-driving, charismatic Larry Itliong. When the 1965 AWOC strike in Coachella resulted in a wage raise, the union calls a strike in the heart of table grape country—Delano. The strike creates painful schisms in the close-knit family. Fausto, fiercely loyal to the union, tirelessly devotes his time to organizing and the picket line. Benny also joins the union, but is torn about making the sacrifices or looking for work in other crops to support his family. An older cousin becomes a labor contractor and sides with the growers. Fausto’s wife, unable to understand his obsession with the strike while she endures a personal tragedy, leaves him and returns to the Philippines. Fausto once again joins the lonely life of the manongs. Though Enrado conveys a sweeping view of Philippine-American history in her novel, Fausto is no one-dimensional everyman. The author plumbs the depths of his confused feelings, misplaced anger and often irrational actions to create a multi-faceted, if deeply flawed, central character. When writing historical fiction, it is a tough call to decide when to include real personages and when to fictionalize them. For the most part, Enrado tackles this well, deftly weaving in historical details about village life in Luzon, pensionados, World War II, and the grape strike in her fast-paced novel. There were just a few moments that gave me pause. Enrado provides a vivid description of Larry Itliong, the cigar-chomping, tough union organizer who rallied the Filipino workers to strike and to join forces with Cesar Chavez to form the United Farm Workers. But she errs on a crucial detail. When Fausto meets Larry, the AWOC leader says, ‘You’re from Ilocos Sur? I’m from San Nicolas, Pangasinan in Ilocos Norte. Cigar?’ Itliong, who was from Pangasinan, would never have said that because Pangasinan is not in Ilocos Norte. It is its own province, complete with its own language—known locally as Pangalatok—very, very different from Ilocano. Enrado uses the real name of Paulo Agbayani, the manong who died on the picket line and for whom Agbayani Village is named. In contrast, she creates a pseudonym, Fahmi Sallal, for Nagi Daifullah, the Yemeni UFW striker who was killed by a blow to his skull by a Kern County Sherriff’s Deputy. Why not use Nagi Daifullah’s real identity? He was a bold, committed organizer whose name should also be remembered. 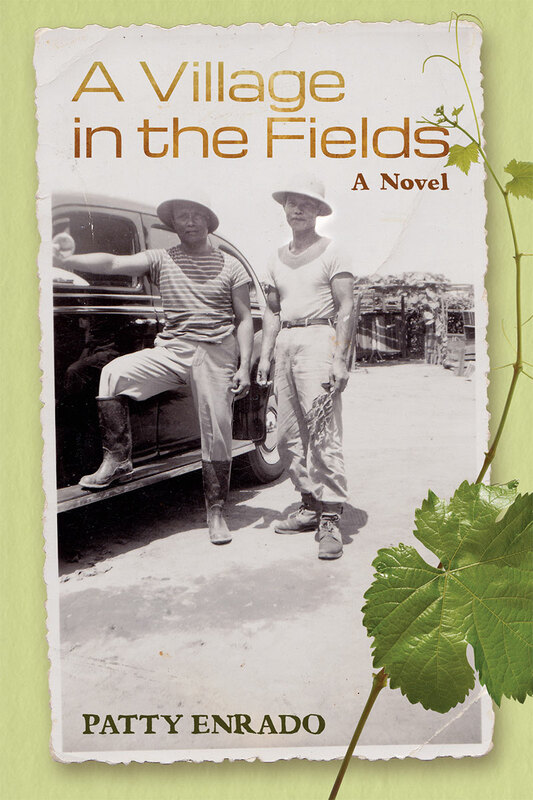 “Patty Enrado’s novel, A Village in the Fields, follows the life of a Filipino immigrant laborer in California whose compassion and strong moral compass abetted a significant victory for powerless farm workers, but at tremendous personal cost. Paralleling many of the themes of Carlos Bulosan’s much loved 1943 novel-memoir, America Is in the Heart, Enrado’s story about shattered promises and dreams embedded in the Filipino-American immigration experience joins a rich cannon of literature on the migratory experience and its impact on familial relations, while also revealing the integral role Filipino Americans played in the Cesar Chavez story. One such person is Larry Itliong, a person who existed and initiated the actual strike, but had largely been forgotten by mainstream depictions of history. Enrado introduces him as well as other real-life strike leaders such as Cesar Chavez and Philip Vera Cruz. Enrado pored over newspaper articles and interviews for research in a book that took 18 years to write. Her straight-forward telling leaves little room for doubt as to the pain endured from pesticide sprays, repetitive motions, and dirty living quarters. She illustrates the psychological tactics used by foremen in the fields to pit workers against each other based on race, thereby increasing productivity. And she allows her hero to see through their manipulation: ‘There was no need to create trouble and distrust. They were all poor. They were all still strangers in America – decades later.’ At times the reader forgets the story is from one person’s perspective because Enrado carefully depicts all sides of the conflict from Chavez to the various unions; to Yemeni, Mexican, and Filipino farm workers; to the growers and to the student protesters. “It is 1997. Fausto Empleo is the last of the retired farm workers living at Agbayani Retirement Village. As his life draws to a close, Fausto expects a visit from a relative. But before his arrival, Fausto insists on sharing his life story to the nurse caring for him. His account reflects the hopes and dreams of Filipinos seeking a better life in America amid hardships. 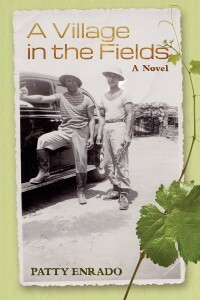 Enrado’s debut novel aptly captures the trials and tribulations of Filipino-American life, especially for farm workers fighting for justice during the epic yet turbulent Delano grape strike. Rising author and storyteller Patty Enrado raises awareness to a portion of history that is often overlooked and not well represented in literature. While her third-person narrative focuses on the account of her fictional character, Fausto Empleo, Enrado tightly weaves in the plight of Filipinos (1920s-1970s) striving for the American dream. Enrado has created a well-developed cast, many who serve as foils in the life of one stubborn, yet courageous man. Fausto, who is a fierce representation of Filipinos’ perseverance for dignity, constantly faces racial inequality and is forced to make difficult decisions within a flurry of undermining circumstances. The results—many times—are harsh, especially to his family. Enrado’s writing style immediately draws readers into Fausto’s gripping tale from its inception with an opening scene in the historic Agbayani Retirement Village. Enrado punctuates her plot with Filipino and Spanish language and uses conversational scenes to develop her characters and story, as well as to reenact the tension felt by immigrants trying to plant roots in a new country. Alternating between the present and flashbacks to Fausto’s life experiences, Enrado pays special attention to the camaraderie and strife between manong (brothers) while lacing historical references from the early to mid 20th century. Enrado closes with a note listing historical deviations that have been made to suit her text. From the crushed grapes of the epic 1965 Delano grape strike, Patty Enrado has crafted a moving story of the farm workers of the San Joaquin Valley and their quest for dignity and a livable wage. A Village in the Field is a gripping account of the nation’s most protracted labor dispute, and the heavy price it extracted from the workers and their families. Here is a modern-day Grapes of Wrath saga that is destined to place Enrado as a rising star among America’s new legion of crusading novelists.